"The creation of art is not the fulfillment of a need but the creation of a need. The world never needed Beethoven's Fifth Symphony until he created it. Now we could not live without it." 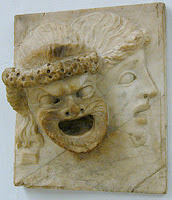 The "twin masks of comedy and tragedy" are used to represent the creative arts, particularly theater. Shakespeare was the master in handling both masks. These concepts were born in ancient Greece more than 2,500 years ago. Their endurance across the centuries reflects the power of drama and the twin themes of joy and despair which bracket the human condition. 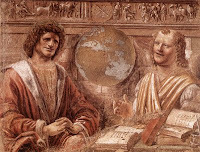 Though they can appear separately and indeed evolved as representations of different dramatic art forms, their appearance together holds far more symbolic importance. 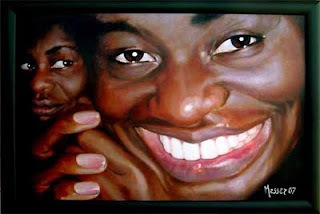 On that theme, I did two years ago this portrait of 'Funmi Adewole, an artist, a dancer, a poet and friend of mine. The idea was to convey 'Funmi's different facets or her personality, sometimes sad, sometimes happy. The two facets are in a sort of "emotional perspective". I submitted it then to the annual National Portrait Gallery (NPG ) "BP award". It was not even short-listed by the jury. 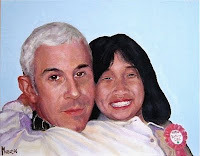 This is a portrait of myself and my daughter. I believe that both expressions, apparently "opposite" (sad and happy) in fact complement each other, just like so-called "opposite colours" (eg red and green. blue and orange, yellow and purple...) complement each other. This is Leonardo da Vinci s Joconda with her mysterious smile: happiness or sadness?